Book bound in grey limp vellum binding with Islamic geometric pattern of thin strips of vellum, with text sewn to the inside lining and to the cover with grey silk thread. With its protective black box and black leather slip outer cover decorated with twelve pointed star. Vellum prepared, not dyed or coloured. 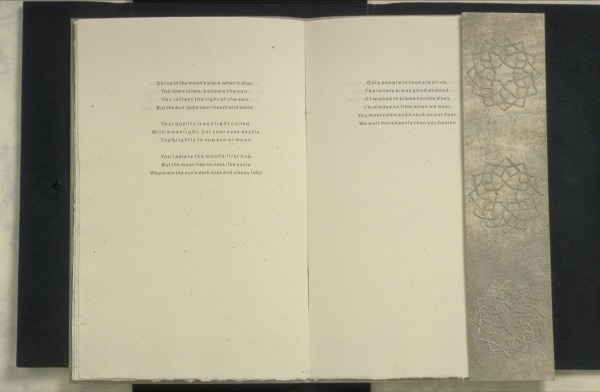 The decoration, made by lacing thin strips of vellum through small holes, has a technical function because it attaches the cover of the book to its inside lining of vellum. The text has been sewn to the inside lining of the vellum and to the cover with grey silk thread, visible on the spine. The thread has been gathered through a small circle of vellum in order that it should be less vulnerable to 'snagging'. The book is bound in a limp vellum binding. The vellum was prepared by Benjamin Vorst of Benyon Ltd, North London. Natural grey, not dyed or coloured. Printed (letterpress) by Michael Gullick, published at the Red Gull Press, Hitchin, Herts. Twinrocke paper hand-made by Kathryn Clark in Indiana, USA. Poems by Majnum Laila, Jen Lindsay, 1985, Crafts Council Collection: B38. Photo: Todd-White Art Photography. 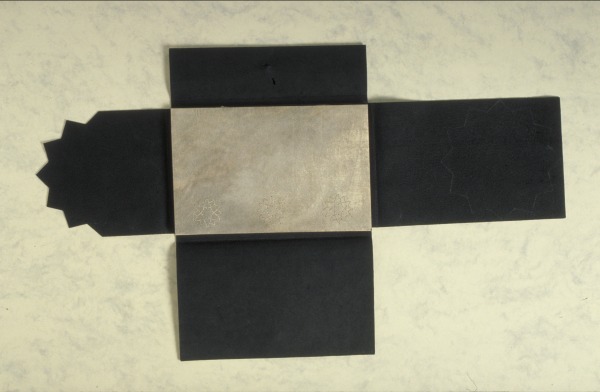 The style of the binding echoes that of Islamic bindings in that they traditionally have a foredge flap to protect the foredge of the text, and the motif laced through the front and back covers and through the foredge flap is fairly typical Islamic geometric pattern. In this case the motifs, each of which is made by lacing thin strips of vellum through small holes, are not simply decorative but also have an important technical function in that they attach the cover of the book to its inside lining of vellum. The sections of the text have been sewn to both the inside lining of vellum and to the cover with grey silk thread, visible on the spine; the thread has been gathered through a small circle of vellum in order that it should be less vulnerable to "snagging". Laila was a seventh century Arab poet.